I’ve found a fascinating description of the Smoketown Hospital as it was in January 1863 in a letter to an Indiana newspaper. I came upon it while looking into one of the many soldiers of the 27th Indiana Infantry wounded at Antietam, Private Thomas Mitchell Gaskins. The writer lists some of the patients, like Gaskins, and their status, which is immediately useful, but his description of the hospital facilities and staff are the most interesting pieces to me. 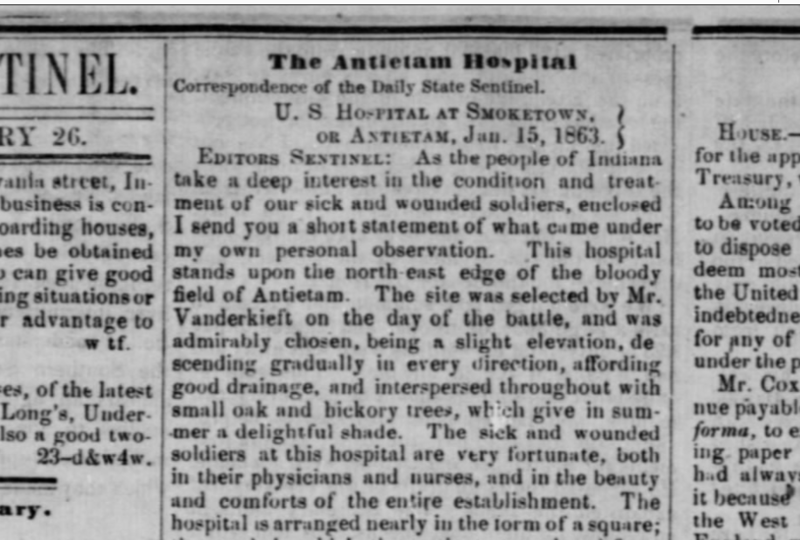 Editors Sentinel: As the people of Indiana take a deep interest in the condition and treatment of our sick and wounded soldiers, enclosed I send you a short statement of what came under my own personal observation. 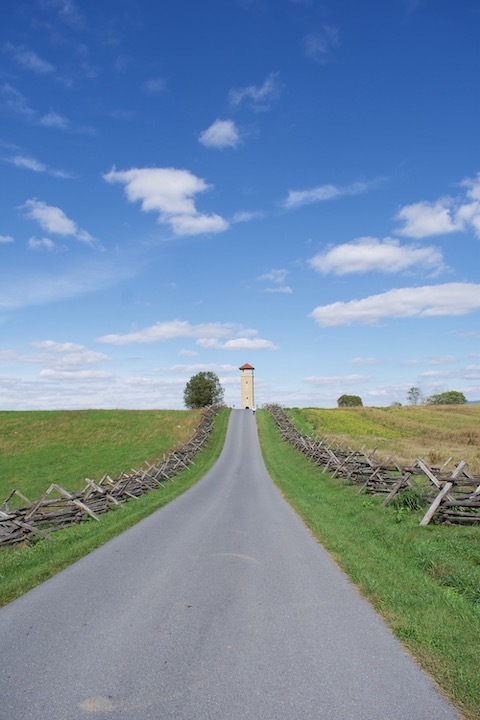 My project on the visual history of the Antietam National Battlefield continues, focused today on one of the most iconic features on the field – the Observation Tower. Since it was built in 1896 the tower has been a central memorial and educational feature of the National Battlefield, and it has always been a popular destinations for visitors. So how did it come to be, and how has its story evolved in the last 122 years? It starts with the origins of the battlefield park itself. At the eleventh hour on the eleventh day of the eleventh month in the year 1918, the Great War ended under the terms of an armistice, a cease-fire agreement, signed at 5 o’clock that morning. 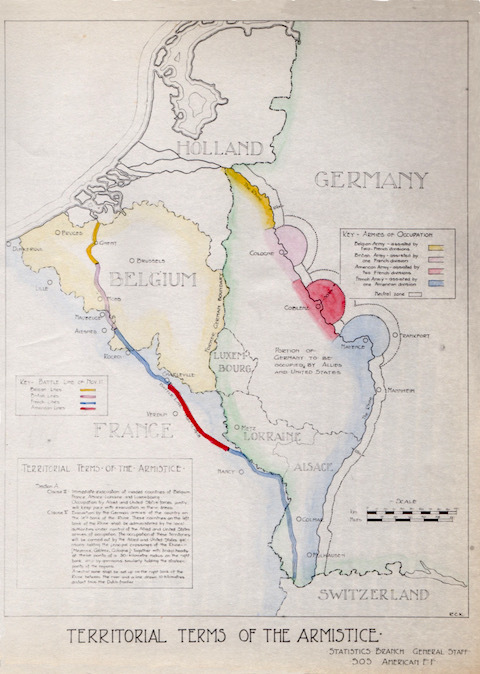 The most immediate requirement of the Armistice was the withdrawal of all German forces to the line of the Rhine River, which, along with “beachheads” on the east bank, was the part of Germany to be occupied by Allied troops. French, British, Belgian, and American. One of about two million Americans of the American Expeditionary Forces (AEF) in France that day was 23 year old Joseph F. Downey from Scranton, Pennsylvania, my grandfather. That lovely hand colored map, Territorial Terms of the Armistice, is among a stunning cache of papers he left us. They’ll help me remember him and those millions of others on this centennial of the end of the First World War.